The blogosphere is going bananas this week over Warner Bros. Animation’s forthcoming ThunderCats animated series, the latest in a long line of 1980s franchise resurrections that will, of course, be accompanied by an extensive line of action figures. You can check out a first (albeit blurry) look at the Bandai toy line on display at the London Toy Fair by visiting ThunderCats Lair. Further fueling the fervor over the fighting felines of Third Earth (alliteration! ), Japanese animators Studio4°C have released this official look at the characters in this series. 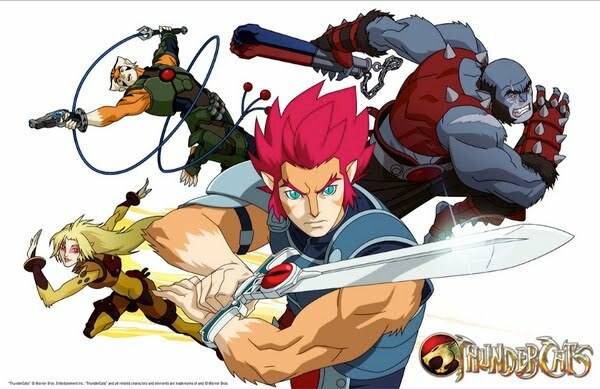 Pictured are Tygra, Cheetara, Panthro and Lion-O, who is brandishing the Sword of Omens. Like most animated series these days, the new ThunderCats has a very anime look to it, and I have absolutely no problem with that. It’s reminiscent of the short-lived 2002 Masters of the Universe relaunch, which brought us some pretty cool toys and an underrated animated series. Let’s hope this new version of ThunderCats doesn’t cough up a hairball on our childhoods when it debuts on Cartoon Network later this year. All the cat allusions!! HOOOO! I appreciate and share your open-mindedness for the new series. I think it could be a lot of fun. And, yes, bring on the classic toyline! It's funny. Because of the whole "Hoooo" thing, I've always associated Lion-O with "Hacksaw" Jim Duggan. The 2X4 of Omens? This does not look bad at all! Its more of a new series than a "re-imagaining". They still look pretty much the same, at least as far as i can remember! Hooooo!